I have been a teacher for 25 years, a Headteacher for 10 years and, at the age of 49, this much I know about developing a Dweck-inspired Growth Mindset culture. What follows is much of what I said at #TLT13 on 19 October 2013. There may well be a video of my talk available soon. How did you find out that the only way to be good at something is to work hard at it? I didn’t need to read Gladwell or Syed, for me it was Jack Nicklaus and Joe Strummer. 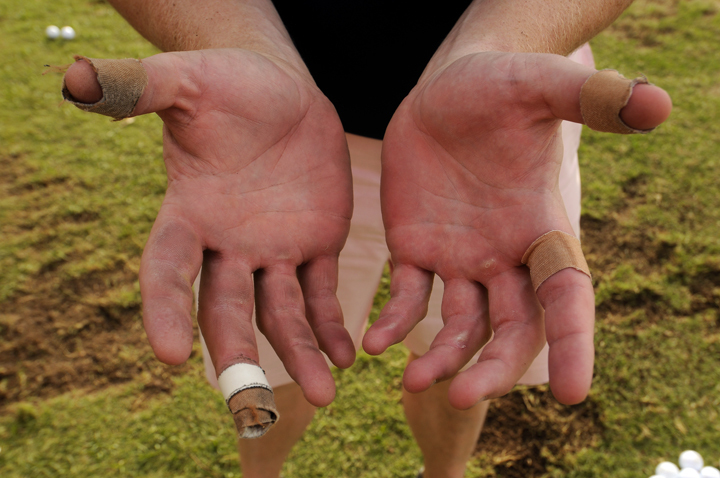 The blisters on my hands and my permanently misaligned shoulders were/are testimony to my determination as a youth to be the best golfer in the world. Conversely, my complete failure to play guitar like Joe Strummer is down to my lack of Strummer-like effort – if I put in my 10,000 hours even I, with my incredibly limited aptitude, could get past Yankee Doodle Dandy, the acme of my guitar playing career. In everything I’ve ever done I have made the most of my modicum of ability by working really hard! I want to work in a school where industry and commitment are seen as virtues by every member of the school community. Hardly remarkable, I know, but the opposite notion – getting rich quick with the minimum of effort – has plagued the human race for a long time. Go see Ben Jonson’s The Alchemist if you don’t believe me; I saw Sam Mendes’ production at The RSC in the early ’90s and Sir Epicure Mammon was dressed in a banker’s pin-striped suit. Jonson’s play is the best explanation of why people still buy lottery tickets, even though if you buy a ticket on the Monday you’ve more chance of dying by the Saturday draw than winning the thing! 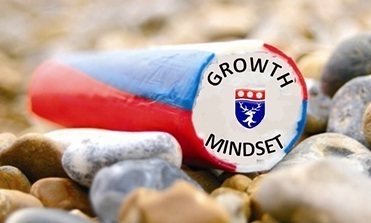 How do you systematically transform your school so that a Growth Mindset attitude runs through it likes the words in a stick of seaside rock? Carol Dweck was asked this at about 10.50 am on 4 June 2013 at the Metropolitan Hotel in Leeds and she didn’t really have an answer. Her theory is spot on; the challenge for school leaders is to make real what Dweck (convincingly) theorises about attitudinal culture in schools. I assume that you know what Dweck’s Growth Mindset is all about. If you don’t, have a peek at this video of the Dweck-Queen herself explaining its essence. Tom Bennett’s summary is pretty good too: Dweck’s research falls into the category of most of the best of our research into education, in that it merely ends up confirming the eternal truths of the classroom: turn up, work hard, study, do well; work harder, do better; believe you can improve and you probably will, believe that you can’t and see what happens. You could also read Dweck’s book. You cannot begin to think about developing a Growth Mindset in your school unless you have read the book and understand what the Dweck-Queen is proclaiming. My blog on Failure might help. The Jordan Nike advert is awesome and I never tire of watching it. You can plan to idevelop a Growth Mindset culture. We have a Junior Leadership Team which has a single focus – to lead on Growth Mindset. Make the development of a Growth Mindset culture a whole school priority. For the next three years we are focused on Growth Mindset and teacher-coaching and nowt else! You have to leap the cognitive hurdle first: convince your staff and then the students that intelligence is not fixed. It should be easy, shouldn’t it? If intelligence is fixed we may as well all give up now! Convince the staff of the efficacy of growth mindset. When you convince the staff, do three things. Explain that brains can grow (the neuroscience bit), use hard data to show it works and emphasise to them that the whole project is about students working harder – the latter is a real winner! I think we are all tired of students’ learned helplessness. Convincing the students that they can all get better with effort hinges upon a really good explanation of the neuroscience. For many of our students the mere fact that their futures are not fixed is both revelatory and motivational. Work smarter, not harder is an unhelpful mantra. It suggests there is a short cut to success. As an alternative, how about Working harder makes me smarter, our strapline for the next half-term? Get a hard data baseline. We used Dweck’s own questionnaire for our students and for our staff we developed our own; one of the JLT grew up in a family where the single mantra was, There is no such thing as failure, just success and learning – mum and dad helped with the questionnaire. When shown to her, Dweck said the questionnaire was, Nice…really nice, so as far as we are concerned it’s Dweck-endorsed! Once you know about Growth Mindset your mind will have already changed. Don’t entitle the questionnaires Growth Mindset Questionnaire or you’ll get a Cosmo magazine style response. And of course there’s always the Hawthorne effect which will skew your results if you are unnecessarily transparent about what the questionnaire is measuring. Dominic Cummings is unfairly dismissive of the Syed/Gladwell stance when he says, Various books have promoted the idea that people require the same amount of practice regardless of talent and that “10,000” hours is a sort of magic number – put in those hours and you too can be great, don’t worry about your genes. What we are saying at Huntington is something more subtle – if you work hard then you can improve significantly, whatever your starting point. I will never be Jimi Hendrix, but if I really stuck at it I could improve my guitar playing considerably. To be fair to Cummings, his recently traduced treatise on the importance of genetics in children’s academic careers is slightly more nuanced than the media have led us to believe. Gifted and Talented is such a dreadful label. We had a moment of illumination very recently; we asked ourselves, Why do we need such a label on our set lists? And the answer is, of course, to help us ensure our expectations of those particular students are appropriately high. Therefore, they are High Starters: on our set lists we will have HS7, HS10 and HS12 for those students starting the Key Stage with high academic scores. If those High Starters don’t work hard they won’t make the most of their aptitudes and if you weren’t a High Starter at the start of the Key Stage you can be by the time you start the next one. Plan the implementation of Growth Mindset for your specific school. I have provided our materials for you to peruse below, but you need to think hard about what will work best at your school in your context. You cannot launch Growth Mindset twice, so plan hard before launching. And if you are looking for materials to assist you as you develop your growth mindset strategy, our Junior Leadership Team has a Growth Mindset blog which they are just about to launch which you may find helpful. I would also like to know why the work of Mihaly Csikszentmihalyi on Flow http://www.ted.com/talks/mihaly_csikszentmihalyi_on_flow.html and Dan Pink on Motivation http://www.youtube.com/watch?v=u6XAPnuFjJc aren’t getting as much coverage. Maybe it’s because Pink in particular institutionalises the problems? That puts the ‘blame’ somewhere unwelcome! Dweck’s views seem based on the belief that you can be anything you want to be, if only you work hard enough. How very Affluenza! Csikszentmihalyi and Pink offer another perspective – but it places attribution elsewhere, to my mind more helpfully. Hard work is only a virtue if it’s taking you somewhere you want to go. The irony is, if particularly if you are challenging *teachers* over this, the system in which they work is driving much of their innate growth mindset out, by forcing them to behave like automatons on a production line. That’s certainly my professional experience – much of my enthusiasm for teaching has been driven from my by a mindless ‘system’ which expects me to leave my brain at home and just do what I’m told, no matter how daft – and yes it has jaundiced my view of people like Dweck. She would blame that experience squarely back on me, which I know is not justified, as it is perfectly possible for people to be demotivated by external factors. Just saying ‘jump higher’ isn’t always a fair answer. 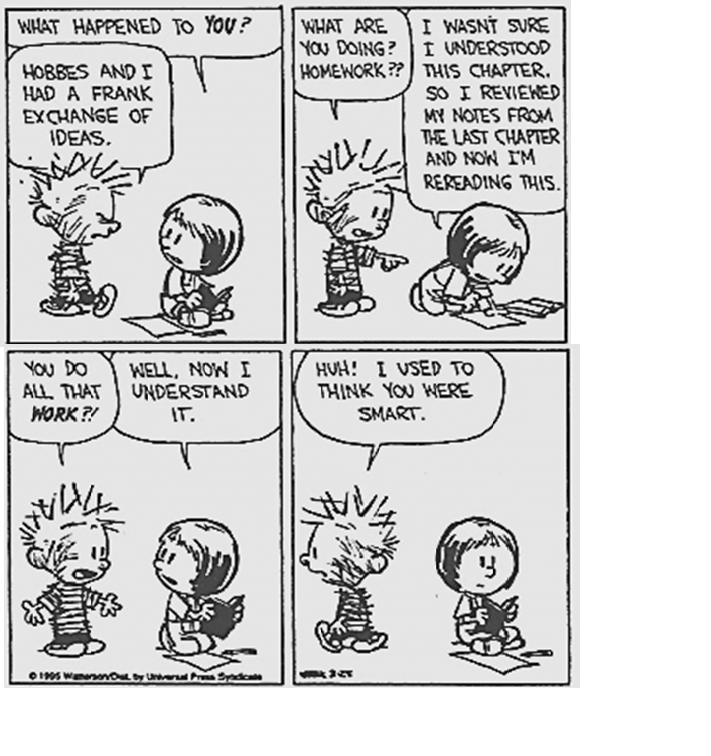 In actual fact, there is an easy way to reconcile Dweck with people like Cummings. It’s so simple that I can’t understand why it hasn’t been further explored. Any car has a fixed horsepower engine – but that doesn’t mean that you are already driving it at full potential. A good teacher can show you how to use more of what you have got, without falling for the delusion that any car can be a Ferrari – or anyone an Einstein if only they try hard enough. This also allows for the possibility that growth mindset can actually be driven out of people – or that you might have it in one sphere of your life – say golf – and not in another, say playing the guitar. (In my case it was the opposite way round!). Apologies for sounding negative; there’s much to learn from ‘mindset’ – but an awful lot of P-C rubbish being spouted along the way. I’m not sure which camp Dweck falls into. The fact that she couldn’t answer your question rang an alarm bell in my mind. Thank you for posting. My school has only recently jumped on the Dweck-train and while I agree she has valuable ideas, I was unwilling to take everything she said at face value. I have neither read Csikszentmihalyi or Pink, but will definitely further investigate their research in the hope of bringing a more balanced idea to my principal. I would be interested to know what you think when you’ve got through them! Your departments who are teaching everyone to A*.. That fills me with utter joy. Setting target grades does not sit easily with growth mindset philosophy. As ever, this is an inspiring and incredibly useful blog post. Thanks! I haven’t heard Dweck say that you can be anything you want to be, more that potential is unknowable which is truly exciting. I grew up being told I wasn’t academic or sporty because I didn’t achieve as quick as some of my peers or my brother. This fixed mindset stayed with me for years and was in part cause for me giving up at school and getting no qualifications at the end of High School and not working hard at sport because I was told I was not a natural. Luckily, the realisation that all my mates were doing A levels and I wasn’t, forced me to go back to sixth form, retake and pass GCSE’s and the rest is history. For me. I believe it could have been so different if the messages from home and school were more constructive, focussing on hard work and embracing setbacks rather than talent. I was in a meeting with the Head and Deputy of a Primary school recently who both had similar experiences as children. And of course, labelling serves a purpose in that the person who labels doesn’t have to be responsible for investing in that person because no amount of effort will improve him or her. Too many people are written off too soon and I am so pleased that we are finally recognising the excellent work of Dweck, Csikszentmihalyi and Pink and how it can improve perceptions of achievement. And even more exciting is that Dweck didn’t have the answer to that question at conference. She does not have all the answers or profess to have and its the passionate people who will grasp her findings, be creative and put them into practice. Sounds like you and the staff at your school, Jon, are well on the way to creating a Growth Mindset School! Like you, I am passionate about the Growth Mindset and equipping staff, students and parents with the knowledge and skills to manage their minds so that they can be the best that they can be. I would love to come up and see it in action sometime! I am an NQT in the York area teaching maths and I am so happy every time I hear someone talking about growth mindsets. I couldn’t believe my luck when I picked up “Bounce” to read over the Christmas break last year. I was hoping for an escape into sport but got such an insight into development that I would say it is the second most important book on teaching I’ve read, over all the books assigned to the course. I changed my approach to work and my ideas of what teaching is. The best book has to be Dweck’s early book called ‘Self theories’. So much depth and so many avenues to think about – currently I’m concerning myself with learning goals vs. performance goals, how we phrase things really does matter in the long term. Are TBAT outcomes setting out a pass/fail situation for students that will lead them towards a fixed mindset? I’m interested to look through all the files you have posted here (thank you). I hope to get through them all before our NQT session on student motivation tomorrow after school. One worry I have is the use of the word ‘trait’. A trait is something intrinsic, something fixed. I would worry that the students are getting mixed messages. Another question is about how you handle setting? I will certainly be looking here again to see how things work out and to grab some mindset resources. I wish you all the best in implementing these developments. Maybe one day I might get the chance to talk to you about some of these ideas. Although I think I try to minimise learned helplessness, I am part of the problem rather than the solution. I really enjoyed reading this. Thank you for taking the time to share your ideas. The challenge with theory like this is transferring it into practice. We had useful conversations about the feedback we give pupils both verbally and through marking. What came out was a decision to ensure feedback was related to the effort and didn’t reinforce the fixed mindset that pupils often bring to school. We now don’t have teachers saying “What a great reader you are!” but instead, “I can see from your agenda you read every day and now you are really improving as a reader.” Simple difference in approach but in everything we do and say we are reinforcing the growth mindset. Hi John, Great blog. I’m doing a post grad on the how mindset impacts learning in Y7 Mathematics. I thought the questionnaires were excellent. Can I ask if you designed them. If you did, can I ask if I may use them in my study? I will course credit you in the study. How have you found the embedding the mindset across the school? Reblogged this on Class Teaching. Hi, John! I was wondering if I too could have permission to use this questionnaire informally at a meeting with a handful of new Girl Scout CEOs in a few weeks. I really like how the questions have been developed. I will include whatever credit line you prefer. Sorry for the short notice – and great work! This was really helpful to me as a new concept. Greatly appreciated – Thank you! 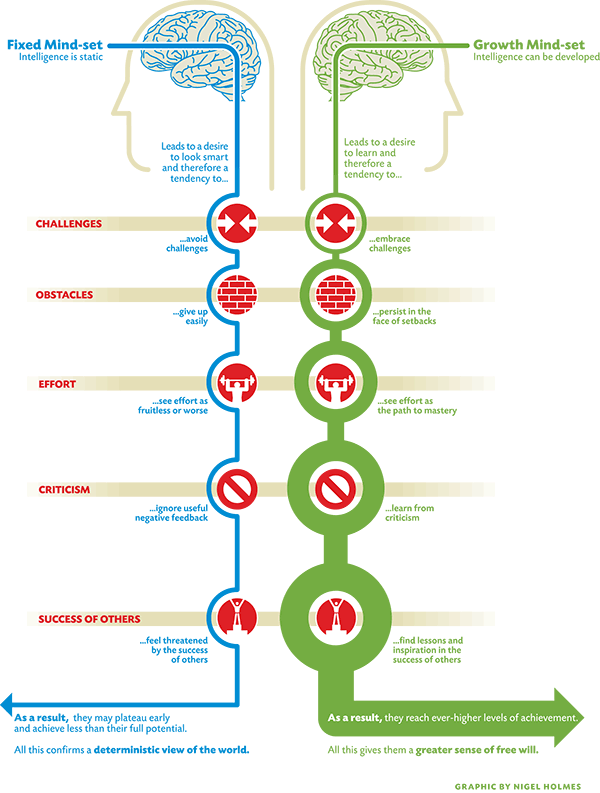 Pingback: This much I know about…developing a Dweck-inspired Growth Mindset culture | Tim Boileau, Ph.D. I am just starting on this journey and come across your blog. After ready the info you write and others across the web I have a problem…. Many people comment on having one high challenging task (say A*) that is given to all students and then simply scaffolding students who need it to help them reach this target. I like this idea of not putting a glass ceiling on any student….however….. I have also read a lot about ‘choice’ and ‘readiness’. This, as I have read, is about giving students choices of activities that they feel ready to complete – surely this contradicts the one task for all. If students have choice then who to say Mr Lazy always chooses a task slightly lower for him, and on that note – Should such tasks be graded (easy/mid/hard)? Let me explain my thinking…. Created 3 different tasks (easy/mid/hard) that focused around the given topic – I was then going to tell the student’s they can choose the task that feels right for them…I was thinking I had cracked it, but then started to think about the lazy student who would also select the mid task, even though they might be able to do the hard one and what about that student who attempt the hard one and finds it so difficult they loose confidence. Of course, I want all my students to aim for the highest task…at which point I then thought if this is the case, why not just provide the highest task!.. Ditching the 3 different tasks (and 2 hours of work) I then decided to create an A4 worksheet that had one “Big Challenge” on the front and on the back had some supporting material for those students who might need it (trying to predict what issue might arise)…I felt I had really cracked it this time, until…. Mr Headteacher enters the room and asks “Are you really giving a student who is predicted a grade E the same as a student who is a grade A? Are you sure they fully understanding the work? You wouldn’t expect someone one at Grade 1 Piano playing at the Proms would you?…ok so now back to the 3 different tasks…….my head is spinning! This site is great as I am a teacher who is currently studying psychology. I am looking to do research into growth mindset. Just wondering your powerpoint and some of the resources are open for others to use with my staff and within my research? You have explained this topic so well for those of us only getting familiar with the area!